Both my beautiful dogs had physical challenges before starting on TuffRock K9 JF, and I don’t know where we’d be today if not for this amazing product. 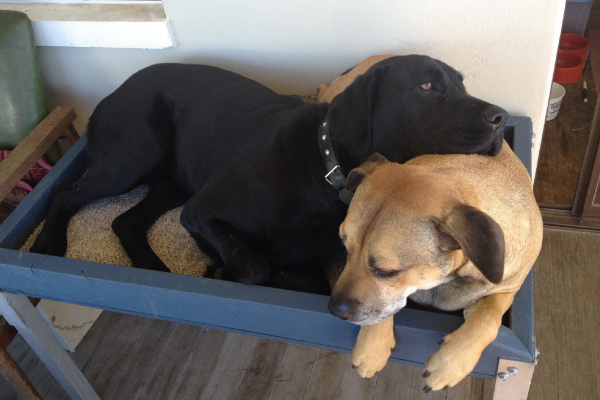 Our “little girl” Bindi is a 6yr old Staffy/Kelpie/Bullmastiff, who was run over by a tractor when she was a puppy. We got her when she was 3.5yrs old and we assume nothing was ever done about internal damage to her leg from the accident. She would hop on 3 legs of a morning, refusing to put weight on the sore leg for about half an hour.Bella is a now 2.5yr old Labrador X who obviously grew much bigger than expected, as we bought her off Gumtree at the age of 12 months from a family with 2 young children and a very small backyard! Her temperament was flawless but she was always very stiff of a morning, taking what seemed like forever to get out of bed. Apparently growing too big too quickly leads to disaster… After a week on the K9 JF, both dogs were completely different – really had to be seen to be believed!! The biggest test was when Bella got a rash on her stomach (completely unrelated to the K9 JF) and we took her off the product for a couple of nights, only to be met with her completely crippled in a day, and barely able to get up let alone walk. Back on the K9 JF and she was fine!Because of TuffRock K9 JF, I now have 2 happy, healthy and fully mobile dogs who absolutely adore life!! I’m so glad there is a product out there to make this possible for my beloved girls!